Clark Barlowe began his culinary career in his hometown of Lenoir, NC, where his family, which can be traced back 7 generations in North Carolina, was a constant source of inspiration for traditional Southern cooking techniques and ingredients. Before attending Johnson and Wales in Charlotte, NC, Clark worked at a small local eatery, Bud’s Pub, in Lenoir. While attending culinary school in Charlotte, Clark worked for legendary Charlotte restaurateur Frank Scibelli at Mama Ricotta’s. Clark also had stints at some of the world’s top restaurants, including The French Laundry, in Napa, California, and El Bulli, in Spain. Clark names his two most formative kitchen experiences as his time at Chez Pascal in Providence, RI, under Chef Matt Gennuoso, and his time spent managing for Clyde’s Restaurant Group, in Washington, DC. Clark has also appeared on The Food Network’s Chopped and Beat Bobby Flay. He was most recently responsible for revamping North Rock Restaurant in Bermuda before returning to North Carolina to open his dream restaurant- Heirloom. With a passion for changing food culture in the United States, Clark spends his time as an active member of several non-profits in Charlotte. He served as a board member of Green Teacher Network (GTN), which works to advance academics, health and sustainability through school gardens and outdoor learning. GTN collaborates with over 30 area organizations in support of school gardens, composting, and growing natural environment. They maintain a network of over 2,000 educators throughout 185 schools in the Charlotte area. Clark is also a founding member of the Mecklenburg Community Food Health Coalition, which brings together partners from the private and public sectors, including the Mecklenburg County Department of Public Health, to deal with food policy issues in Mecklenburg County. Clark is also an adjunct professor in Regional American Cuisine, Contemporary Cuisine, and Latin Cuisine at the International Culinary School at the Art Institute in Charlotte, NC. 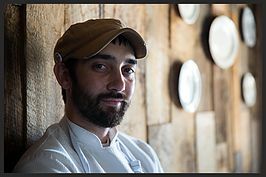 With a primary focus on serving the best North Carolina foods and beverages, Clark enjoys creating original and unique dishes that reflect his travels and training. Clark is an avid forager and when he is not in Heirloom’s kitchen, he can most likely be found in NC forests and fields, sourcing ingredients for Heirloom’s menu.